Hello Handsomites! 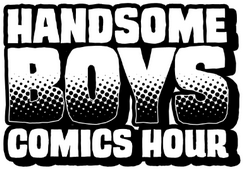 Eric and Robbie are back after a week off with a heapin’ helpin’ of comic book podcast goodness! They discuss two weeks of comics, including a very special rant from Robbie about the latest in Forever Evil! They finish up their Sandman retrospective and talk about the series as a whole, and, of course, talk Christmas presents! So much excellence! This entry was posted in Episodes and tagged animal man, avengers, buzzkill, christmas, forever evil, harley quinn, neil gaimen, pretty deadly, rogue legacy, sandman, superior spider-man, the last of us, uncanny avengers on December 30, 2013 by handsomeboyscomicshour. Hello Handsomites! Eric and Robbie are back once again to bring you a new dose of podcasty goodness! They take a look at the week’s newest books, including a double dose of Grek Pak from DC, a new book from Garth Ennis featuring…dogs?! ?, and their first official look at Superior Spider-man! They talk indie games, board games, and Preacher, and continue their Sandman retrospective with volumes 5 & 6! Come get some, it’s good for ya! This entry was posted in Episodes and tagged action comics, batman superman, eldritch horror, fez, garth ennis, grek pak, indie game: the movie, inhumanity, neil gaiman, preacher, r/conspiratard, rover red charlie, sandman, superior spider-man, tiny barbarian on December 9, 2013 by handsomeboyscomicshour.